As Snoopy would have written, “It was a dark and stormy night” in London. Actually, it had been a blustering cold rainy day, too. What to do? Easy…Jet. Yup, that’s what these two resourceful sisters did when the British weather simply would not cooperate. We booked the next el-cheapo EasyJet flight to Palma, Mallorca. A measly 2 1/2 hours later, we were on a blissfully hot, sunny island. All we really knew about this Spanish island was that in the last few years millions of dollars had been spent trying to shed their rep as “package tour hell” and showcase their Mediterranean charms. It’s paid off big time. 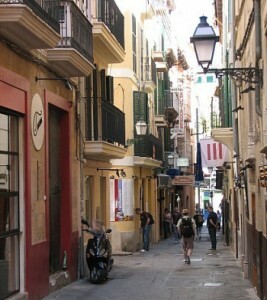 Blimey, if Palma didn’t look just like a shiny new baby Barcelona sparkling in the sunlight. We soon discovered that on top of Mallorca’s inherent charms: bathtub -temp sea, fragrant citrus groves amid olive terraces, dramatic mountains begging to be hiked, pretty-as-a-picture villages liberally sprinkled all over the island and an abundance of impressive cathedrals, castles and hermitages, all combined with it’s recent facelift, has turned the island into a viable up-market retreat, popular with stylish Europeans but still virtually undiscovered by Americans. 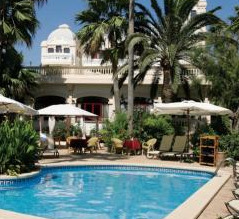 Palma, the cosmopolitan capital, offers a bevy of fashionable boutique hotels (many painstakingly renovated from centuries old palatial homes) a roster of hip restaurants that run the gamut from traditional family bistros to glamorous Michelin starred dining rooms. Great digs, delicious grilled seafood, farm-fresh organic produce, surprisingly quaffable local wines, super shopping at exclusive boutiques and a cluster of apparel outlets. (Don’t miss Campers for some great shoe savings.) Our girlfriend getaway was definitely back on track. 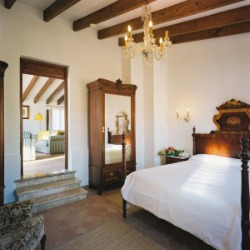 Dalt Murada, a medieval16th century mansion, now a family run hotel, is loaded with character and perfectly situated on a quiet narrow alleyway right behind the cathedral, just steps away from all the major sights. Our spacious rooms (living, bed and bath) were lovingly filled with antique furniture, ancient tapestries, and an array of original paintings-many created by family members. Our room overlooked the fragrant, tree-filled courtyard, where one could breakfast alfresco. This traditional manor house has been in the Moragues family for generations and Mom, Dad and their two adult sons–who both speak excellent English due to schooling in the states—who could not have been more hospitable, are eager to offer suggestions for off-the beaten track restaurants or sites to visit. If you really want to get away from the rest of the world, reserve the gigantic Penthouse Suite with has an oversized jacuzzi and a private terrace. A great choice if you want the real Mallorcan deal-skip it if you’re after a contemporary vibe. This historic four star hotel is listed as a Monument of National Tourist Interest, and rightly so. It’s located about a 40 minute walk from downtown Palma (the hotel offers free beach bikes so you can pedal there in about ten minutes along the newly built promenade) in the quieter residential Ciutat Jardi nabe, right across from the beach. There is no shortage of open-air cafes, fish shacks and bars within walking distance if you don’t feel like trekking to town. Culture junkies will be happy to know that almost all the important sights spiral out from the center of town and can be covered on foot. Some our our faves were the magnificent Catedral de Palma ( aka La Seu), the charming Convent de Santa Clara, the Can Marques –the tour of this grand old mansion (renovated by a wealthy coffee baron) offers a fascinating look what life was like in the early 1900’s. Even though I’m not a fan of Joaquin Torrents Llado paintings, it is well worth visiting the museum, Casa Museu J Torrents Llado to see his stunningly appointed two story studio. There is a growing number of museums well-worth a visit or if you feel like shopping, the trendiest boutiques can be found on C/Brossa street. Tip: if you’re renting a bike (which is a fun way to navigate) make sure you ask for one with a BIG basket. When you’re ready for a break, head down to the action-filled waterfront and nab a seat at one of the sidewalk cafes and while away the hours watching (and dreaming about) the mega-yachts that bob about the harbor. The food in Mallorca is still deeply rooted in the holy trinity: tomatoes, virgin olive oil and lots of garlic. There are plenty of good restaurants now at all price points, so you can choose to grab a bite at one of the many tapas bars, hit a local joint that serves flavorful “sopes” a bread and cabbage based stew, “dirty rice”, roast suckling pig, or a seafood paella, accompanied by one of the very pleasant, inexpensive local wines or sangria.If you’re feeling flush, you can pay your respects to one of the five Michelin starred restaurants. Just to mix things up we decided to try Wasabi, a hip, minimalist Japanese restaurant with a gently-priced lunch menu. Great service and surprisingly scrumptious chicken teriyaki. Downtown, my sis and each wanted to go to a different tapas bar for dinner, so we decided to compromise by going to both. The first was the tried and true classic, La Boveda. You have to wait on line forever only to then be packed in like sardines, but it’s so worth it for their incredible Iberico ham platters, delicious clam and white bean stew, the piquant “pimientos de Padrón” and any of their scrambled egg dishes. Thankfully, we had a 15 minute walk to gear up for round two at La Taberna Del Caracol, which had been highly recommended by one of the boys at Dalt Murada. Completely different setup since there was roomy tables and they take reservations. The place was charming decorated with old tiles, arched brick doorways, pottery and an open kitchen. The highlight here was the chicken wings but don’t order them if you have any romantic ideas for later—they were bathed in garlic-which we adored although we were breathing garlic fumes for days after.